Michael MacCauly is a hard-working family man who has taken the train to and from work every day for the past 10 years. One day, he is approached by a woman who presents him with a question: could he find a stranger on the train for $100,000? Michael assumes the question is hypothetical, so he accepts the task, but when it turns out this hypothetical has very real sinister intentions, he is stuck in a deadly situation he cannot escape. If you need an action star to locate a passenger on some random mode of transportation, Liam Neeson is the guy to call. Whether he has to "Run All Night," whether he is on a "Non-Stop" flight, or whether he simply needs to ride a "Commuter" train, director Jaume Collet-Serra like to keep Liam Neeson moving. This is the fourth time Collet-Serra and Neeson have worked together, and so far, we think they make a solid team. This time around, Neeson plays Michael MacCauley, a former cop turned life insurance salesman. After 10 years selling insurance, Michael is called into his boss's office and is let go without warning. On the train ride home, he is approached by a woman named Joanna, played by Vera Farmiga, who presents him with a hypothetical question: would he locate a person he doesn't know but does not belong on the train for $100,000 dollars? He is intrigued by the question, but when he discovers it isn't so imaginary and that the person he is meant to find is to be killed, he tries to back out, though doing so would mean his own family will be killed. Michael has until the end of the line to figure out what he should do. When we saw the trailer for "The Commuter," we weren't exactly excited by it. We thought the whole premise looked a little silly, though that seems to be the case every single time Neeson is in a movie directed by Jaume Collett-Serra. If we're being honest, the premises of all of their collaborations are a little bit silly. Each time we've actually watched one of their projects, we've walked out of the theater having enjoyed ourselves, and we felt exactly the same way with their latest collaboration, "The Commuter." The story itself is very contrived. The moment you start to think about it, all of the conveniences and the over-elaborate mysterious conspiracy, it entirely falls apart. That being said, there's something surprisingly fun about watching a 65-year-old Liam Neeson use his skills as a former policeman to track down some random person on a train and kick the asses of the people who get in his way. 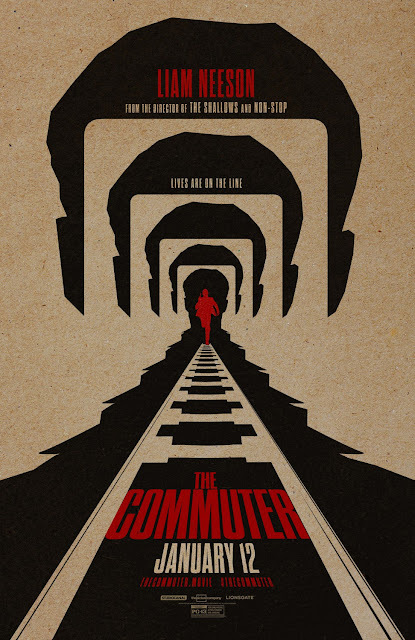 If you're willing to turn your brain off and enjoy yourself, "The Commuter" is a surprisingly good time. There is a lot more tension and excitement than we anticipated. Much of the action enters into over the top, "what the hell is physics?" territory, but let's face it, we don't seek out Liam Neeson action films for their realism. The mystery has a little bit of intrigue, though it is not tightly put together and we never felt wowed by that aspect of it. The camerawork gets pretty shaky at times and the jump-cuts come a bit too often, especially in the beginning when. Even with all its flaws, in the end, we think back on the words of Maximus Decimus Meridius that ask, "were you not entertained?" And for the most part, we were. If you are into Liam Neeson action films, chances are, this one will not disappoint you.